Cirque du Soleil’s Dralion Coming to Atlantic City, NJ Aug 29 - Sept 2, 2012! Dralion is just one of Cirque du Soleil's twenty-one unique productions being shown around the world. Since it's premiere in 1999, over 7 million people worldwide have witnessed this spectacular show that blends Eastern and Western influences. 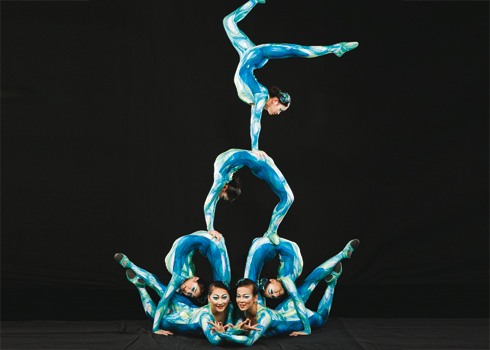 Fusing the 3,000 year-old tradition of Chinese acrobatic arts with the multidisciplinary approach of Cirque du Soleil, Dralion draws its inspiration from Eastern philosophy and its never-ending quest for harmony between humans and nature. The show’s name is derived from its two emblematic creatures: the dragon, symbolizing the East, and the lion, symbolizing the West. Oceane, a goddess of Water. 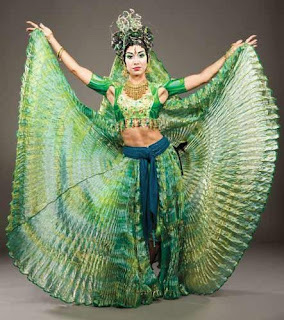 In Dralion, the four elements that govern the natural order take on a human form. Each element is represented by its own color and stunning costumes. Over 16,000 feet of fabric was used to create the costumes and made using traditional and unusual materials such as bubble wrap, window screen...even hardware items! 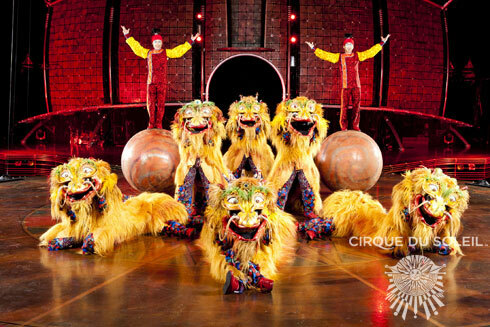 Dralion features 50 international acrobats, gymnasts, musicians and singers. It soars to new heights as it defies the laws of nature in almost a dozen incredible acts that include: aerial hoops, handbalancing, juggling and many more. I'm most excited to the the Dralions (pictured above)! You can click here to see all the acts. A mammoth structure creates the huge backdrop that dominates the stage. This metallic set piece is 60 feet wide and 26 feet tall and is suggestive of a futuristic Chinese temple or a giant plate of medieval armor. Six giant claws are attached to the structure that allow artists to climb and suspend themselves from the wall. Three aluminum rings are suspended high above the stage. These serve several purposes; a catwalk for performers and technicians, to support technical and acrobatic equipment (such as the enormous lantern that descends at the end of the first half of the show) and to move performers up, down and through the world of Dralion. Another thing to mention is the music. You can't have a great show without great music. Dralion doesn't use a pre-recorded score, all the music is performed live along with the show! The band is composed of six musicians and two singers. Together, they blend Eastern and Western sounds to create rhythmic and lyrical motifs that draw inspiration from classic Indian melodies, as well as Andalusia, Africa and Central and Western Europe. As mentioned, you can experience Dralion yourself at the Atlantic City Boardwalk Hall. You'll only have seven opportunities to see the show, so if you're interested, I'd buy tickets asap while you still can! You can purchase tickets from the Cirque du Soleil site or Ticketmaster. Wednesday, August 29 at 7:30 p.m.
Thursday, August 30 at 7:30 p.m.
Friday, August 31 at 7:30 p.m.
Saturday, September 1 at 3:30 p.m. and 7:30 p.m.
Sunday, September 2 at 1:00 p.m. and 5:00 p.m. 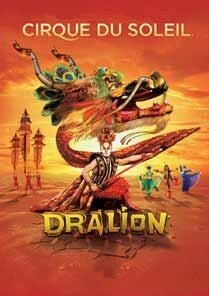 So, will be going to see Dralion (or any other Cirque du Soleil production)? Have you ever seen one? I'd love to hear about your experiences! I need to tell my parents about this. They are very local to AC and love Cirque du Soleil! Sounds like a great show! When I was in Vegas I was able to see Cirque du Soleil's O and it was amazing. Would love to see another show sometime. I've never had the chance to see them either...but AC is only about an hour away so I could totally make this!! I've never had a chance to see them either. What a great opportunity! Have fun!! I saw Cirque's Totem recently but before that had never seen a Cirque show. I'm hooked! Definitely have to see if this is coming here soon. I have never had the chance to see them yet. I am anxiously awaiting the opportunity!! I've been wanting to go myself but now after reading this I'm really going to make sure we go! Thanks for the reminder! I wish I lived close enough to see Cirque Du Soleil. It's on my bucket list. Great article! I had the opportunity to see Cirque Du Soleil in college! It is amazing to watch.